Prepare this dessert ahead of time, cool, and serve with no-fuss on the big day. Preheat oven to 375°F (190°C). Prepare pastry; set aside. For Pastry: Stir together flour and salt in a mixing bowl. Cut in shortening until pieces are the size of small peas. Sprinkle water, 1 tablespoon at a time, over mixture, gently tossing with a fork between additions and pushing mixture to side of bowl. (Add only enough water to moisten all of the mixture.) Form dough into a ball. Roll dough on a lightly floured surface to form a 12-inch-diameter circle. Wrap pastry around rolling pin. Unroll onto a 9-inch pie plate. Ease pastry into pie plate, being careful not to stretch pastry. To build up the edge of the pastry, trim it to 1/2-inch beyond edge of pie plate; fold under. Flute edge as desired. Do not prick pastry. For Filling: Whisk together eggs, pumpkin, evaporated milk, brown sugar, brandy, salt, cinnamon, ginger, cloves,and nutmeg in a large bowl until combined. Pour into pie shell. Cover edge of pie with foil. Bake in the preheated oven for 25 minutes. Remove foil. Bake 25 minutes more or until a knife inserted near the center comes out clean. Cool on a wire rack. Refrigerate within 2 hours; cover for longer storage. 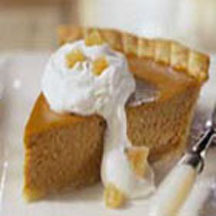 Serve wedges of pie with Sweetened Whipped Cream; sprinkle with crystallized ginger. Sweetened Whipped Cream: Place a medium mixing bowl and beaters in the freezer for at least 30 minutes. Combine whipping cream and sugar in the bowl, and beat with an electric mixer or rotary beater on high speed until cream holds soft peaks. Make-Ahead Tip: Cover cooled pie and refrigerate for up to 2 days. Nutritional Information Per Serving (1/8 of recipe): calories: 437, total fat: 24g, saturated fat: 12g, cholesterol: 108mg, sodium: 233mg, carbohydrate: 46g, fiber: 2g, protein: 8g, vitamin A: 247%, calcium: 20%, iron: 15%.